The Department of Labor is soon expected to issue their final rule on an executive order requiring federal contractors to allow their employees to earn and use paid sick days. The order would allow federal contract workers to use paid sick days for themselves or for their family members. In line with the Department of Labor, our estimates suggest that between 694,000 and 1,053,000 employees of federal contractors may directly benefit from additional paid sick leave, including an estimated 450,000 to 775,000 who currently receive no paid sick leave. According to the latest data, 36 percent of private sector workers do not have access to paid sick leave. Fortunately, state and local public policies continue to make a difference for working families, and the rate of coverage has increased over the last year, from 61 to 64 percent of private-sector workers. Particularly of note is the rate of increase for low wage workers who increased their coverage from 31 to 39 percent. Unfortunately, access to paid sick leave remains vastly unequal, as shown in the figure below. 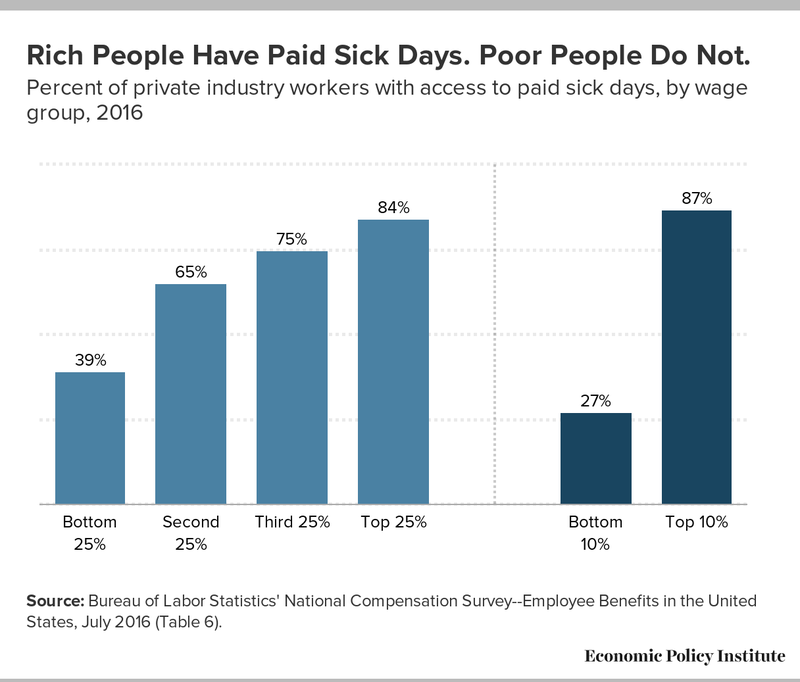 Only 27 percent of the lowest wage workers (the bottom 10 percent) have the ability to earn paid sick time to care for themselves and their family as opposed to 87 percent of the highest wage workers (the highest 10 percent). Source: Bureau of Labor Statistics' National Compensation Survey--Employee Benefits in the United States, July 2016 (Table 6).